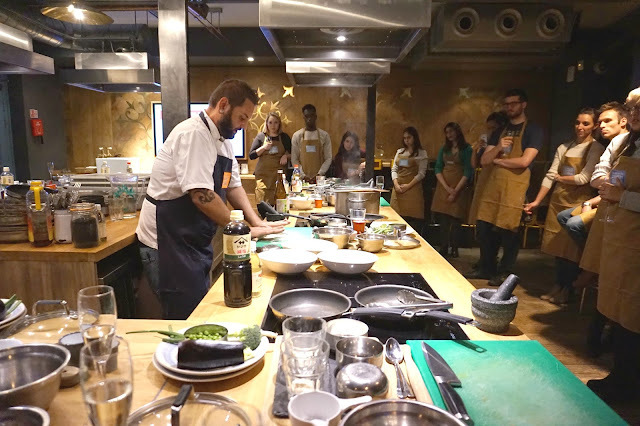 Following on from my recipes for a Greek inspired dinner, I visited Jamie Oliver's brand new Cookery School in London for a Japanese cookery lesson. Jamie Oliver is a household name and his empire is only growing. The latest of his growing enterprises is the Cookery School at Jamie's Italian in Westfield Shepherd's Bush. 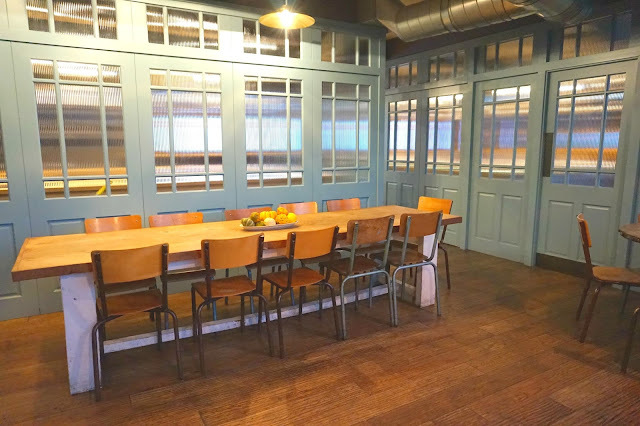 It's not a place you would know exists as it's tucked away at the back of the restaurant which actually I really like because it means general guests aren't disturbed by the cookery school and vice versa. 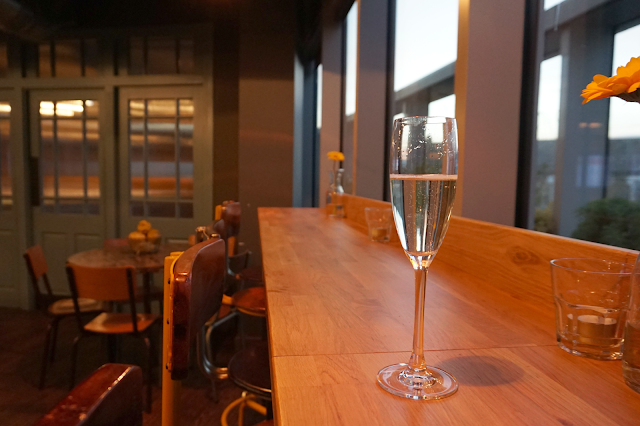 Being a new venue, everything is absolutely pristine and well thought out. On arrival to the cookery school we were given a glass of prosecco which was a lovely touch before being shown into the 'kitchen' which was a lovely room, with a really homey feel and enough space to cook comfortably. 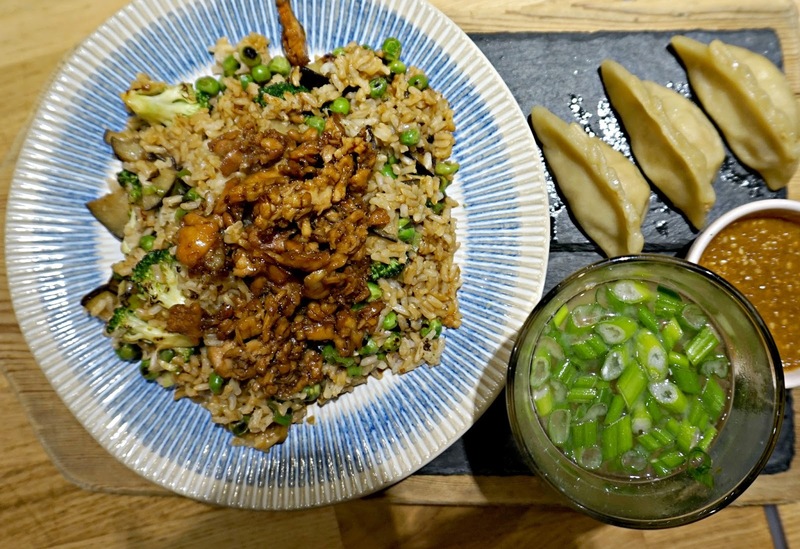 On the menu for this lesson was was Miso Soup, Pork Gyoza with Gomadare Sauce, green vegetable & brown rice stir fry and chicken teriyaki. For a two hour lesson, I was really surprised at the amount of items we learnt about and also got to cook, and taste! Once everyone had arrived we washed our hands and put on our aprons ready to start cooking. The lesson was split into a couple of sections making it easy to follow and understand, even for beginners. Before cooking ourselves, at the beginning of each section, the Chef would talk us through each step whilst also taking time to tell us about the food we would be making, test our knowledge and also allowing us to taste some of the ingredients we were about to use which I really enjoyed. All of the equipment and ingredients were laid out neatly at our stations which meant we didn't waste time waiting for things or gathering items. The pans we used were Tefal by Jamie Oliver, and you all know what a fan I am of Tefal products! Some things were also premade for us in the interest of time for example the dough for the pork gyoza and also the filling but the Chef took the time to explain how everything was made so we didn't feel like we missed out by not making them ourselves. I'll be the first to admit, I'm not the whizziest person in the kitchen but I found the instructions really easy to follow and I'd happily say I think I could replicate the recipes at home. The Chef was very friendly, personable and funny which really made the class that much more enjoyable. He had a good knowledge of the ingredients and his passion for cooking really came through which I think is really important when teaching a class, especially of beginners. After cooking our dishes, we then moved into the next room where the tables were set up and we had chance to taste all of the food we'd just made. We were also able to order some drinks to enjoy with our meal and there was no rush to leave the room which I really liked. For those who couldn't stay to eat, we were offered take away boxes to take the food home in. After the class we were all sent a lovely follow up email with the recipes on which I thought was a great touch as it would have taken the enjoyment away from the class taking time out to write the ingredients and instructions as we were going along. Overall, I really enjoyed the class and would love to take another one. 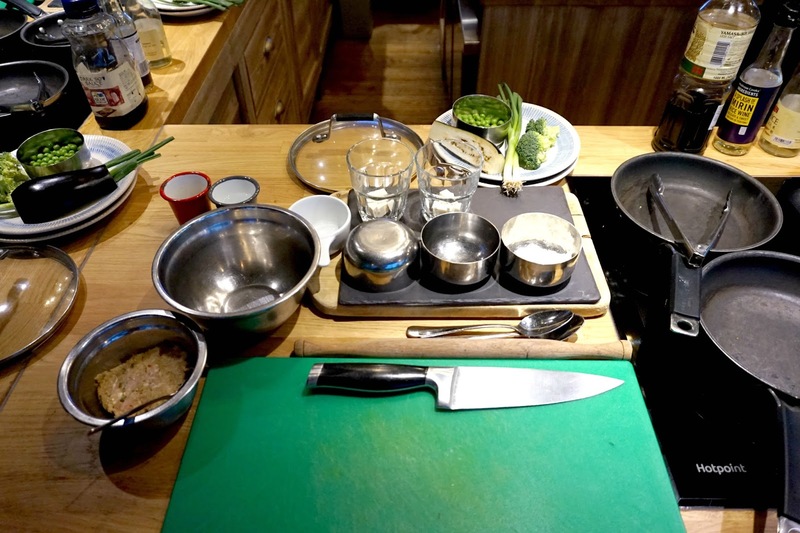 I'm sure there are other Japanese cookery classes that are more authentic, but I found the class was good value for money, friendly, welcoming and they used recipes that are easy to replicate at home, which, after all, is the reason we take cooking classes isn't it?! Look out for my next posts as I'll be sharing the recipes for everything we cooked so you can try them at home too! 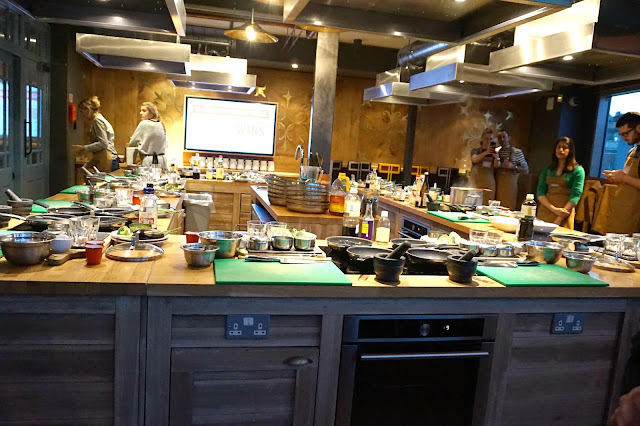 Find out more about Jamie Oliver's Cookery School and all of the classes they offer on their website. You can also follow them on Twitter and Facebook to keep up to date with all their latest news. yum! gyoza is one of my fav things to eat ever! sounds like a lot of fun!